The ugly, dim-witted Deputy Minister who uses his influence to reverse the American government’s decision to strip the Chairman and Nobu’s company of its assets. Since Nobu finds Sato detestable, Sayuri sleeps with him in order to infuriate Nobu, hoping that Nobu will lose interest in her as a result. The timeline below shows where the character Noritaka Sato appears in Memoirs of a Geisha. The colored dots and icons indicate which themes are associated with that appearance. Plaue, Ethan. "Memoirs of a Geisha Characters: Noritaka Sato." LitCharts. LitCharts LLC, 4 Nov 2015. Web. 25 Apr 2019. Plaue, Ethan. "Memoirs of a Geisha Characters: Noritaka Sato." LitCharts LLC, November 4, 2015. 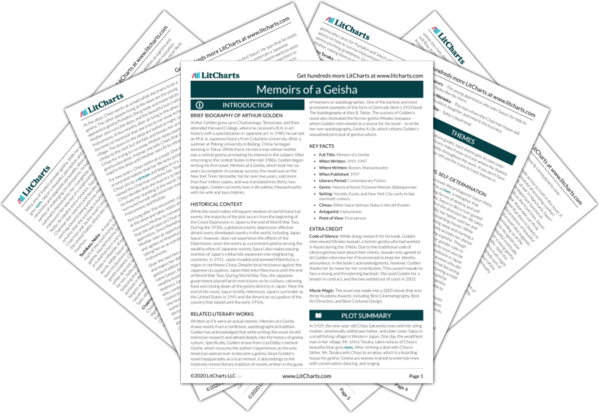 Retrieved April 25, 2019. https://www.litcharts.com/lit/memoirs-of-a-geisha/characters/noritaka-sato.